N'DJAMENA (Reuters) - Chad's President Idriss Deby, in power for more than a quarter of a century, said on Tuesday he would reintroduce constitutional term limits if he won a fifth term in an election slated for April. His campaign promise came amid controversial moves by the leaders of some other African countries including Burundi, Rwanda and Congo Republic who have challenged constitutional term limits to maintain power. 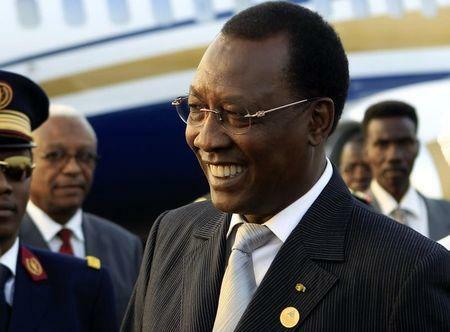 Deby seized power in a coup in 1990 and was most recently re-elected in 2011. A referendum in 2005 scrapped constitutional term limits before Deby won a disputed election the following year. "The principles of presidential term limits in the constitution must be reintroduced," Deby told a convention of his ruling party, for which he is the presidential candidate. "Today nothing requires us to remain in a system where changing leaders becomes difficult ... In 2005 the constitutional reform was conducted in a context where the life of the nation was in danger." Chad has become a key Western ally in the fight against Islamist militants in the Sahel region just south of the Sahara, contributing troops to fight the Boko Haram group based in northeastern Nigeria. The group has carried out attacks both in Nigeria and in neighbouring countries including Chad, Cameroon and Niger.